My stepson Andy calls our house a “death trap for tall people.” It has high ceilings on the first floor, but dormered ceilings on the second and very solid (and very low) wood beams in the basement. In spite of its smallness, it’s cozy. Especially the kitchen. Because it’s the size of a postage stamp, it forces me to do dishes more than once a day (thank god for the Scotch-Brite Soap Dispensing Dish Wand), which means I always have clean knives and cutting boards (even though I’m a bit of a board whore. They are one of my kitchen addictions). It also means more counter space for visitors to sit and chat. I own a lot of cookbooks, but most of them are in the Big Box ‘O Books in the basement. Before I store them in said box, I tag the recipes I make the most, bring the book(s) to Staples, make a copy of each, and stick them in the corresponding homemade recipe file keeper. Not only does this take up less space, I’m free to write any changes or comments on the paper rather than messing up the book. These three-ring gems saved me from recipe hell. You know the place: that abyss of clipped snippets of recipes from magazines, soup cans, applesauce jars, flour bags, the underside of Cool-Whip or yogurt containers, and the sides of rice, pasta and cereal boxes? All those recipes you say you want to try just pile up in the junk drawer until you practically go insane trying to find “that one recipe” ten times a week. I also love LOVE my Clear Solutions Jumbo Cookbook. 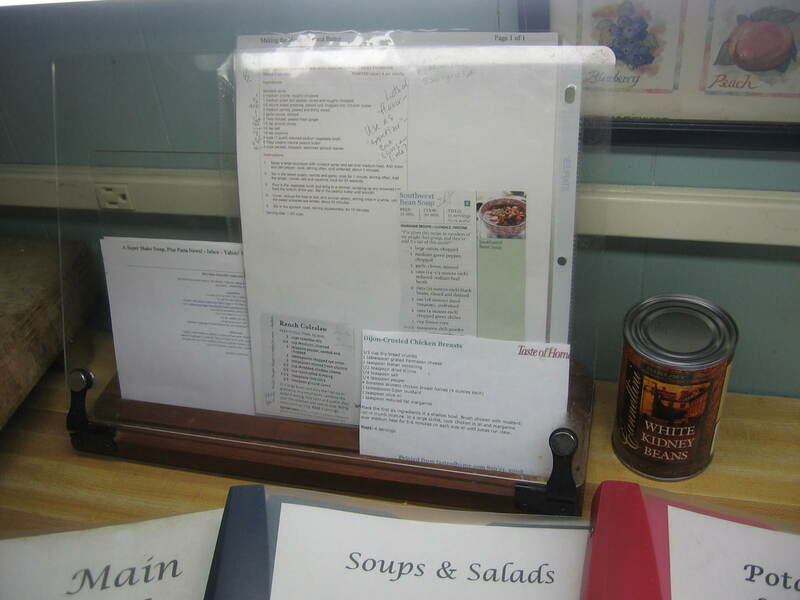 When I plan meals for the week, I take out the necessary recipe from its file or I tag it in a cookbook and stick them all behind the plastic cover guard where they stand ready when I am. You can see in the photo a can of white kidney beans. I’m fixin’ to make some more of those veggie burgers I talked about in my last blog, the ones that don’t fall apart. For two years, I’ve been on a mission to find a homemade veggie burger that doesn’t crumble to bits the second I flip them in the pan or stick a fork in them. Apparently many of you have the same problem, based on the number of requests I received for the recipe. I found this one in my Healthy Cooking magazine from Taste of Home. I’ve typed out the recipe as is, but on this next go round, I plan to add chili powder and use barbecue sauce instead of ketchup to spice them up a little. Place the beans, oats and ketchup in a food processor; cover and pulse until blended. Transfer to medium bowl; stir in rest of ingredients. Shape into four or six patties. On a baking sheet coated with non-stick spray, bake at 350 degrees for 30 minutes (or until well browned), turning halfway through. You can also wrap these individually in plastic wrap and store in the freezer. WAY cheaper (and less sodium) than Bocas or Morningstars. Hope you enjoyed the little tour of my kitchen. Here’s one last photo. It’s of my refrigerator, or as I call it, a big metal photo album. Also, keep in mind this disclaimer if you ever come to visit: I can’t be held responsible if you’re taller than 5’7” and you forget to hunch over when you walk around upstairs or do your laundry in the basement and you smack your head on an overhead light or a big old beam. I’ll offer you an ice cube for the ensuing bump, though. This entry was posted in Uncategorized on February 13, 2009 by Lynn Haraldson. 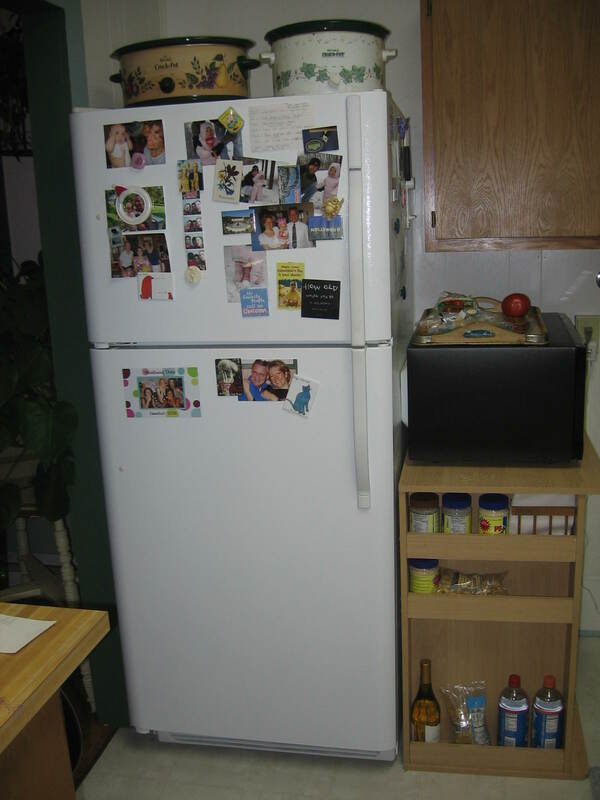 Despite the picture on the home page of my blog, I’ve always wanted a fridge with *nothing* on it. I know, I know. It’s impossible. But a guy can dream, right? Wow, thank you for the recipe! I also can’t wait to try it and I loved seeing the pics of your kitchen! 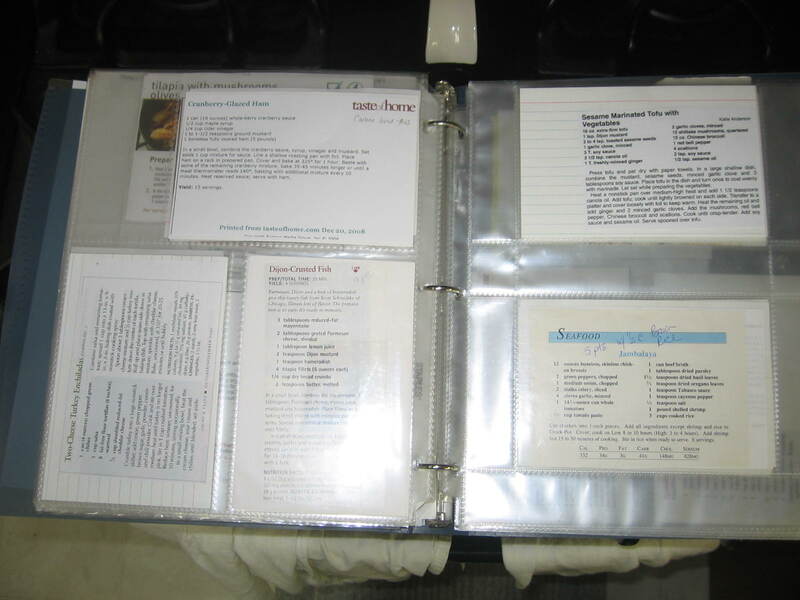 I love the idea of the plastic pages and binders to keep favorite recipes in. 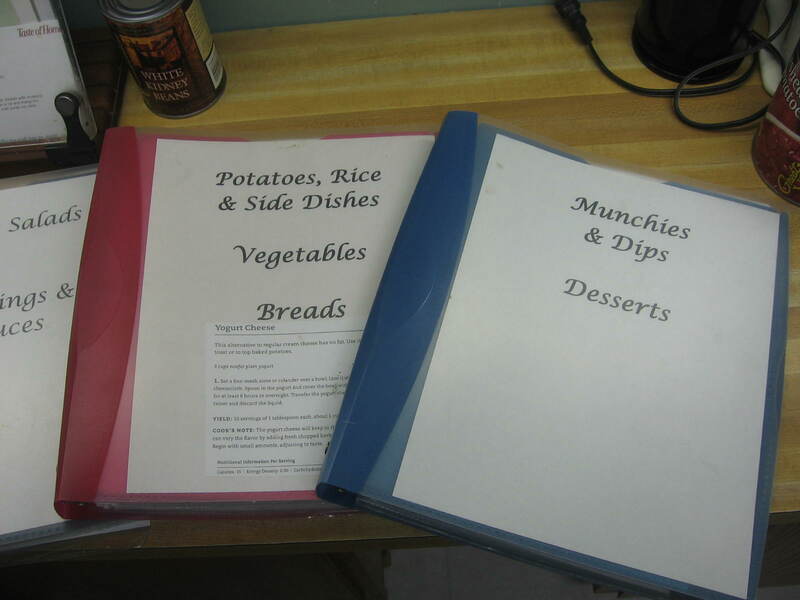 I have a little paper recipe book that I paste stuff in, but it is getting harder to find stuff, and if I had it in the binder I could organize the foods by category! 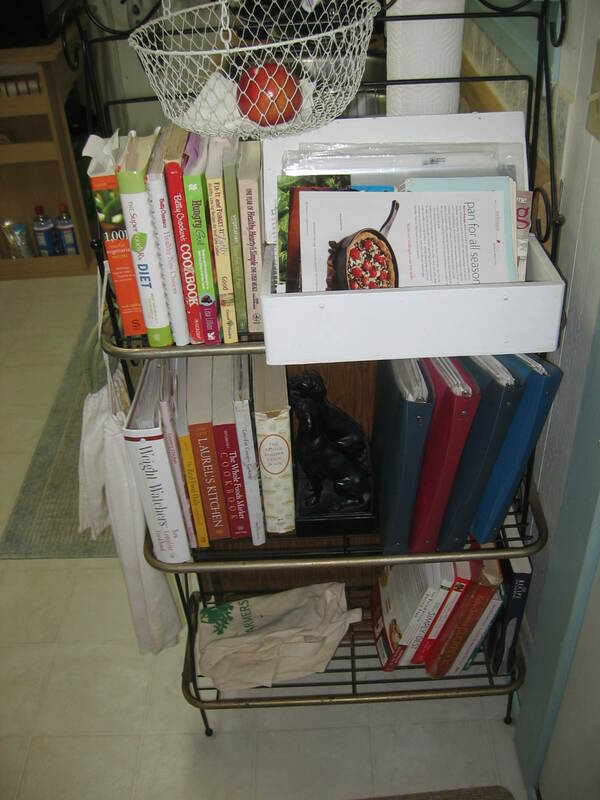 Plus, I can move out a whole shelf of recipe books taking space in my tiny kitchen! THANKS!